We had our first home visit with our ACW on Saturday! When I spoke to her last Friday, we set up our appointment for yesterday afternoon and getting our fingerprints done Friday. One thing she mentioned which we both – actually a few classmates too – questioned was the need to get things done within 90 days and if not, we’ll have to have stuff run again (abuse reports, domestic violence reports and fingerprinting). The reason not being that we won’t have new fingerprints or anything like that, but rather so they can ensure that nothing has changed in our background – criminal or otherwise. OK, explained that way it makes a whole lot more sense! We sat and answered her questions and she answered ours for about 90 minutes. After that we gave her the tour of our home and yard. I had to hold Phoenix so he wouldn’t bolt out of the middle bathroom so she could take a look at it. She was amazed at how large the child’s bedroom is and that it has a private bathroom and massive closet. We pointed out where the furniture was going and how we were moving the desk currently in there into our bedroom. We then selected the next date she’d come out to ask us more questions and show her the hopefully furnished bedroom. She left a huge packet of info for us to begin filling out and signing. There was some informational info in there as well about the process, etc. We also need 5 personal and professional references. We have 3 in mind and need to select the other 2. Oh and also ask everyone if they’d be willing to write a letter for us. We learned that she won’t actually help us with the placement of our child. Once she completes the home study, it will be passed to her supervisor for final review and approval. 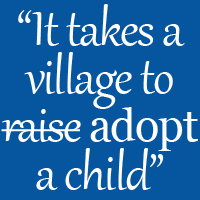 If there is anything that needs further explanation, we will be referred to the Adoption Review Panel. If it gets approved, he will pass it along to Our Kids and I will make sure my contacts there have it as well. They will then work on matching us with the best possible child so we can begin the informal setting dates, day visits, and eventual sleepovers. Aside from these visits with the ACW, there really isn’t much going on. We have to work with the process and let it work for us. All we can do is cooperate and wait patiently and try not to look at the little munchkins on the photolisting sites. ← Fingerprinting! And other good news..
Pingback: Becca Blogs | Moving Right Along..